There’s a message that’s been sitting on my heart. I think it might be for you. In case you didn’t know, I started my business with NO MONEY. My husband and I had lost our jobs and had $0 coming in. We went from 2 six-figure incomes to absolutely NOTHING! When I tell you that it was the BIGGEST BLESSING of my life, it is no lie! I know it sounds crazy, but NOT having the money you need to start your business can be the biggest blessing of all! So how did I do it? I made a cake. A cheap cake. With very little money. I got inquiries about it, so I took a deposit for an order, used that money to purchase supplies and ingredients, then made another cake (that was better). And on, and on. I kept track of all the money that was coming in, and only spent what I had made. WITH THE OCCASIONAL infusion of capital, (once my husband started to work again), for bigger items that would help me EXPAND MY CAPACITY. A refrigerator in the garage… A rack in the kitchen, a few extra pans or an extra mixer. I made more money, then invested some of it to GROW FURTHER. And I tracked everything along the way to see what worked, and what didn’t! Was it easy? NO. But do-able? ABSOLUTELY. And REWARDING AS HELL! Friend, when you finally figure out how to make something from nothing, man… NO ONE can take that away from you! THAT’S the true definition of SELF MADE my friends! 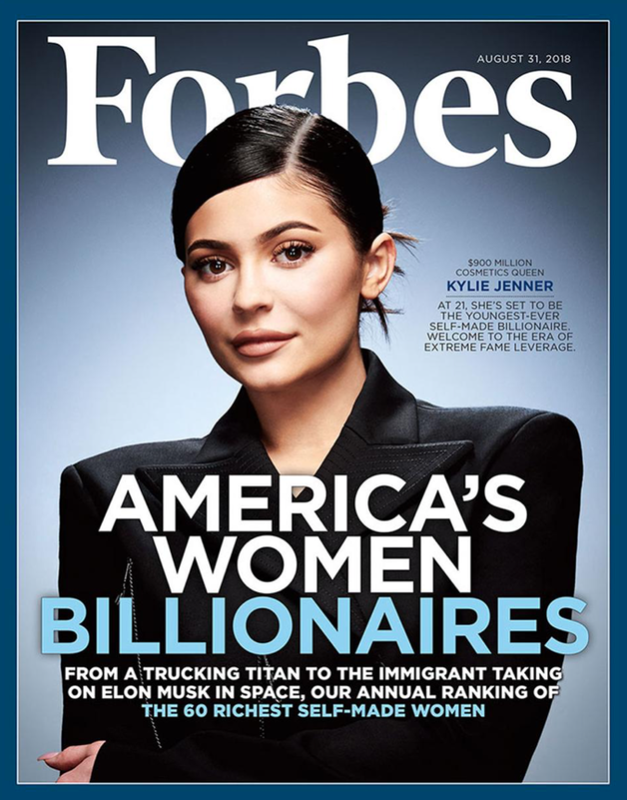 NOT this Forbes cover. This holiday season, as you sit there possibly disappointed about the money you don’t have… Or the revenue that your business has YET to generate… Or the success you have yet to achieve… Remind yourself of this: YOU ARE CAPABLE! And THIS is part of your amazing journey! So you can’s skip it! Friend, you have more resources than you believe! More at your fingertips… So much more at your disposal than you have convinced yourself of. More connections, relationships, resources… Access to more answers than you’re even searching for! SO much MORE than you’re giving yourself credit for. I wish when I started my business, I had someone to tell me this. I wish someone had said, “Girl, hang in there… The reward will be so much SWEETER than you can even imagine. IF you just believe in yourself. If you just don't give up. And IF you utilize and leverage alllll your resources! Get crafty, figure out a way, and put yourself out there! BUT, ONLY IF YOU SHOW UP FOR YOURSELF and practice being FAITHFUL OVER THE LITTLE THAT YOU DO HAVE RIGHT NOW! The servant who had received the two talents also came and said, ‘Master, you entrusted me with two talents. See, I have gained two more.’ His master replied, ‘Well done, good and faithful servant! You have been faithful with a few things; I will put you in charge of many things. After some time, the Master responds and says, “OMG Daughter! You have done OUTSTANDING! I knew you could do it! But not only have you grown and developed more talents, you’ve also prepared yourself for PROMOTION! You have been faithful with the very few things I gave you; which shows me you are now ready for MORE!. So now, I will put you in charge of MANY things! Well done, good and faithful servant! So, ARE YOU BEING FAITHFUL OVER FEW??? Friend, I hope this message served you. And if you really needed this message, please COMMENT BELOW and let me know you receive it! And if you really wanna help, please share it with someone who might also need it! Sending all the love and blessings your way! If you think you might be ready to join our amazing Passion To Profit Alumni community and finally take that business to the next level, join the waitlist here! Class starts on Jan 28th 2019 and we’ll have some amazing payment options available for you! BUT YOU have got to be committed!